This isn't in the Camra pub walk guide, but looked too imposing to pass on by. What a location. We sat outside and I had a Youngs Golden Something. Not shower, something else. Even finished off our meal started at the Black Lion by sharing a pudding here. Youngs pub. 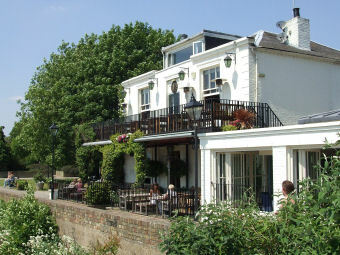 Great location on the river with plenty of outside seating - some under a sun terrace. We sat on the terrace overlooking the river, which provided plenty of entertainment. Inside is also good - solid and attractive. This is a well run pub with everything clean and efficient. Food is tasty, though not cheap; and while it is tasty, it isn't cooked to order - so while service is quick, the food may have been sitting under light for a while. Our Yorkshire puds were dry and the veg limp. For the price I would expect better. Beers are ordinary, Special and Bombardier. We had the Ordinary and the Special; both were lifeless, and at nearly £4 a pint that is unacceptable. So - great location, but expensive, not good quality, and poor value. Service is, however, very pleasant. And the high point is watching the boats on the river - especially the yachts. A group of six ex-colleagues met for a social evening drink and meal, however, we had our evening thoroughly spoilt by an officious, surly and arrogant manager, together with her duty manager. My colleague would have liked to have our group sit upstairs on the open balcony, but was challenged by the manageress and told it wasn't open unless we were eating - we were! On a second attempt at trying-out the balcony, my colleague was again challenged by the manageress and told where the toilets were - he was simply trying to set up a corner for our group of six. I arrived rather later and went into the downstairs bar and waited for more than 10 minutes, but with no bar service - other people were served but we were ignored by the bar staff until another colleague of mine made direct comments to one of the bar staff. We were advised that as we were waiting near the food ordering part of the bar, we would not be served any drinks - just a gentle reminder or enquiry whether we wanted to order food or drinks was all it would have taken. We were told to get to the back of the queue by the duty manager, who said that someone had taken the signs from the bar saying that food only could be ordered from that section of the bar. I wasn't at all happy with the duty manager's attitude - he was abrasive and had a perceived ego problem with his own self-importance - I asked for his name and then asked if we might be served by him now, which he took offence at and declined our request, then the manageress came out from behind a door and said that she'd heard all the preceding conversation and wouldn't have her staff spoken to in this was. I asked her for her name and she duly gave this and then stated that we wouldn't be served at all again. We had all arrived from different parts of London and further afield and we all felt humiliated by both the manageress's lack of social skills and spitefullness, together with the duty manager's over- inflated ego. Hospitality is the key here (or lack of it) - this pub is not hallowed ground nor precious and deserving of aloof and prickly welcomes! The management should be removed at the Old Ship, Hammersmith, in favour of customer-focussed and friendly staff. This pub only had about 20 customers on that evening - I wonder why, and most certainly would not advise anyone to visit for a pleasurable experience. We went there and sat outside on the terrace and had an incident where some cutlery 'fell' off the upper terrace and landed on my head. I don't know what happened (supposedly staff were involved), but when the matter was reported to the manager, he handled it extremely well and gave us some drinks. I was impressed with the no-nonsense, professional way with which he dealt with the matter. We ate there later on and I have to say the food was good. I'm not sure about the general layout and the decor of the pub, but the response of the manager to the earlier incident was good and has not put me off going to this pub again. Came here for our office Christmas party on Friday evening. It's the first time I've been in here for a long time. The ground floor is fairly spacious and similar to most other pubs along the riverside, it is dominated by wood. There is also a large kitchen you can view. We had the upstairs room with a balcony looking out over the river. I believe Youngs Bitter & Special were on in the main bar, plus the 2 other beers we also had upstairs a Youngs Christmas beer and East London Nightwatchman. Meantime beers are available in bottles. The main pub was very quiet by the time we left at shortly after 5pm. I couldn't quite understand why they had failed to keep the upstairs bar manned and had closed it for the evening when there were around 30 people there. Eventually, we decided to take our custom elsewhere as a result.